Here at Modern Trailer we are proud to offer our customers the RV Warranty Forever. This impressive program provides you with everything you need to hit the road with confidence. The RV Warranty Forever is not a scam. It’s an incredible program that provides you with peace of mind while you’re traveling. All parts and labor are covered with RV Warranty Forever. That means that 100% of these costs will be covered by your warranty. To ensure you’re covered you’ll need to make sure that you have all of your maintenance performed by a licensed RV repair company. Annual maintenance is only $160.50 at Modern Trailer. That means that your simple maintenance cost will save you thousands and thousands of dollars on higher cost repairs. Proper maintenance helps to ensure your RV is being taken care of and less susceptible to breakdowns. Routine maintenance will ensure your RV gets the care it needs to properly function, therefore breakdowns will be less likely to happen. Claims specialists are available Monday – Friday 8:00am-8:00pm and Saturday 9:00am-5:00pm EST to answer all of your questions. So this means that you can easily get in touch with them to understand what is covered and what isn’t. You will absolutely love how easy using the RV Warranty Forever is and how convenient it is to take advantage of. If you experience an RV breakdown while traveling all you have to do is take your RV to a certified repair shop. Hand the repair shop a copy of your RV Warranty Forever paperwork and the repair shop will take care of the rest. That’s one of the best parts about RV Warranty Forever. It promises you peace of mind and convenience. You don’t have to bother with any of the annoying paperwork that comes along with insurance claims. If you’re interested in learning more about our selection of new RVs for sale, contact us. We can answer any questions you have and make sure you have the information needed to make the best decision for your needs. We can also assist with RV financing and assist with helping you plan your next RV trip. In the market for an impressive travel trailer that doesn’t break the bank? Forest River’s Vibe travel trailer offers tons of incredible features, all at a price point that is sure to delight. From ample storage to fabulous floorplans, this RV is a great option for families eager to travel together. Read our Forest River Vibe travel trailer review to learn more. The Vibe’s kitchen was made for families who enjoy cooking. You’ll appreciate how each Vibe floorplan comes together to offer you tons of counter space, high end appliances, and an enjoyable cooking experience. Whether you’re getting ready for the day or winding down, it’s wonderful to know you have a living room the whole family will enjoy. From watching the morning news while eating a freshly made breakfast or just hanging out because the weather isn’t cooperating, this space is warm and inviting to everyone. Exploring our beautiful country can be exhausting. That’s why people love Vibe’s bedroom. It comes with an impressive Denver Mattress, as well as overhead storage, a nightstand, and a wardrobe. Whether you’re waking up to conquer the day or bedding down after a day of fun, this place promises to be your home away from home. If you’re interested in learning more about our selection of Vibe travel trailers for sale, contact us. We can answer any questions you have and make sure you’re equipped with the information needed to make the best decision for your needs. We can also assist with RV financing. Anderson, Indiana is proud to feature tons of fabulous RV parks and campgrounds for your family to explore. You’ll love every minute spent exploring this unique area. In fact, many of our customers choose to make Anderson their first RV destination since our RV dealership is located so close to these campgrounds. The two campgrounds below are the two that are closest to our RV dealership. These are favorites among many who purchase an RV from us and even our team members who take little weekend RV trips. One of the best things about these parks is that they’re very entry level and particularly good for those who are new to RVing. They offer lots of fun for you and the family, but aren’t far away or exotic, so you can take advantage of them to get used to your RV. The White River winds through this gorgeous campground that features a 13 acre island and a mile of riverfront footage. Ball State University is located 15 miles away and offers a lovely place to explore a college town and make memories with the family. Limited availability October 15 – April 15. Beach: Memorial Weekend – Labor Day Weekend. The maximum pull through length is 100 feet. If your family is full of history buffs, then you will absolutely love this state park. It’s aptly called Mounds State Park because it features 10 Native American sacred mounds built by prehistoric Indians known as the Adena-Hopewell people. At 252 acres this park has the White River winding through it and boasts loads of enjoyable activities. One of the most talked about activities is the walking trails. People love how these trails are carved out and take you on tons of fun adventures. If you’re interested in learning more about our selection of new and used RVs for sale, contact us. We can answer any questions you have and make sure you’ve got the information needed to make the best decision for your needs. We can also assist with RV financing. If you’re looking for a lightweight travel trailer that offers tons of features and doesn’t cost an arm and a leg. These RVs range between 18′ and 28′ and can be towed by mid-sized SUVs and half-ton vehicles. Read our Freedom Express Ultra Lite travel trailer review to learn more. A great kitchen can make all the difference in how you enjoy your RVing experience. The Freedom Express’ kitchen was designed to offer you a delightful cooking experience through high end appliances and unique storage solutions. One of the best things about this space is the deep sink, which makes washing dishes so much easier and less messy than in a sink that is more shallow. Freedom Express’ bedroom offers you a lovely space to relax and unwind at the end of the day. You’ll love every minute you spend in this space. Whether catching up on sleep or reading a good book, you can’t help but love Freedom Express’ bedroom. You’ll love how the overhead lighting above the bed provides soft light for reading after a long day of fun. This living room was made for family time. Whether you’re watching a movie or playing a game, every minute spent in this space will be one filled with fun memories in the making. Perhaps one of the greatest features is the large entertainment center, so you can watch the big game or your favorite movie with the family. If you’re interested in learning more about our selection of Freedom Express Ultra Lite Travel Trailers for sale, contact us. We can answer any questions you have and make sure you’ve got the information necessary to make the best decision for your needs. Our team is experienced in RVing and delighted to share our knowledge with you as you embark on the exciting RV lifestyle experience. If you’re looking for a lightweight travel trailer that offers comfortable accommodations for the entire family, look no further than the 2019 Keystone Springdale Mini. This RV promises big features for a small price and is sure to keep you happy wherever you are. Read our 2019 Keystone Mini review to learn more. The kitchen in the Springdale Mini was designed to make cooking amazing meals for your family fun and enjoyable. From the ample counterspace to the lovely appliances, every part of this kitchen was made with your comfort in mind. One look at the impressive kitchen found in every Springdale floorplan and you’ll see what makes this an amazing option for families. From ample storage to a spacious booth dinette where you can enjoy freshly made meals with the entire family, this space was designed to make living and eating in your RV a truly enjoyable experience. The pantry is a small example of the smart storage solutions found throughout the Springdale Mini. 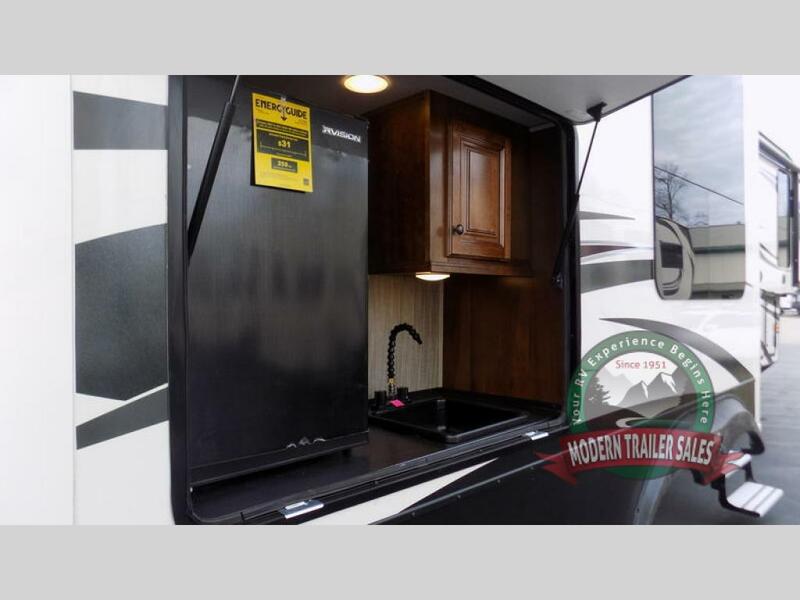 With all the storage space available, you’ll love how this RV truly meets your needs. If you’re traveling with a growing family then you know how important storage is. The large pantry featured in the unit was designed for you to be able to store all of your favorite items and feed your family with ease. In addition to the pantry, this RV features a wide range of genius storage solutions that allow you to bring along all of your favorite items. From overhead storage to pass-thru storage. This well laid out living room offers you everything you need to enjoy your time on the road. Whether you’re watching a movie or playing a game, every minute spent in this space will be one of fun. If you enjoy kicking back with your family and watching the game or viewing a movie, then you will love the Springdale’s living room. This space was designed to be warm and inviting, while offering a plush space to kick back and unwind. If you’re interested in learning more about our selection of Keystone Springdale Mini travel trailers for sale, contact us. We can answer any questions you have and make sure you have the information needed to make the best decision for your needs. Now through January 27th we’re offering incredible discounts during our Show Must Go On sale. You’ll find spectacular discounts on travel trailers, fifth wheels, pop-ups, and more. Our selection of fifth wheels is sure to impress. 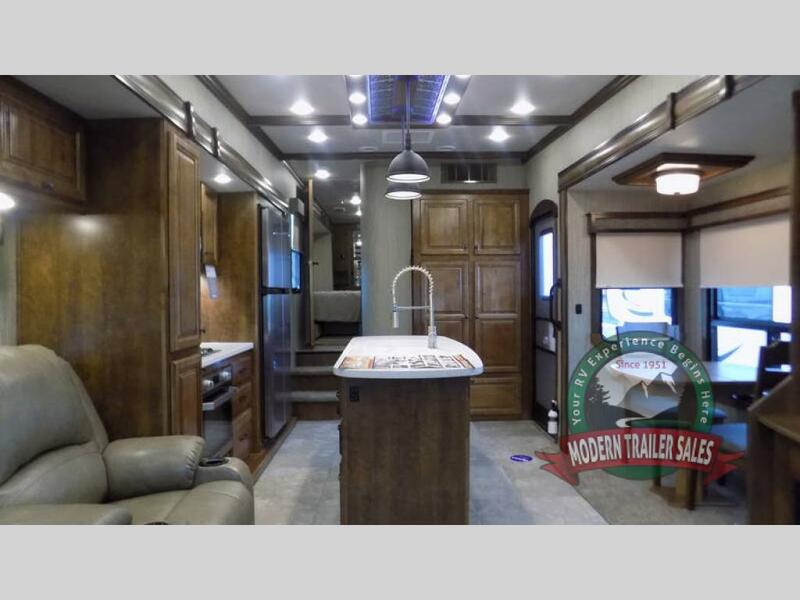 From the Keystone Springdale to the Sprinter Campfire Edition to a HUGE selection of used RVs, you’re sure to find what you need here at Modern Trailer. Additionally, we would love to walk you through available units and give you an idea of what your vacations in them will be like. From the Springdale Mini to theWildwood FSX, our selection of travel trailers was hand-picked to ensure you get the unit that best works for you. Whether you’ve got a large family or are a couple hitting the road, we can help you determine which floorplan and brand would work best for you. Pop-up RVs are a great option for anyone looking to get into RVing and out of tent camping. They are the quintessential entry level RV and promise you a comfortable living experience without breaking the bank. Check out our selection of pop-up RVs for sale and reach out for help determining which would be best for you. If you’re interested in learning more about our selection of new and used RVs for sale in Indiana, contact us. We are here to answer any questions you have and make sure you’ve got the information needed to make the right choice for your family’s needs. We can also assist with RV financing. 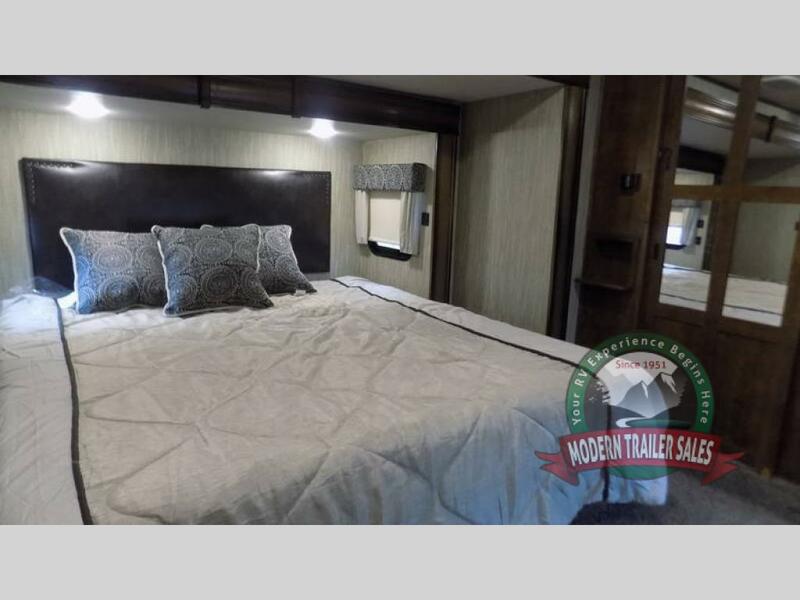 If you’re in the market for a high quality fifth wheel, but aren’t sure where to start, check out the absolutely stunning 2018 Heartland Big Country 3310QSCK. This RV sleeps four people, making it a great option for couples and small families looking to hit the road. The gorgeous outdoor kitchen makes creating great meals on the grill super easy. Bring on the tailgating, brats, and beer! If you plan to use your RV while tailgating or want to entertain while outside, then the 2018 Heartland Big Country is a great option for you. It boasts an outdoor kitchen that you can use to whip up great meals for the family. This is perfect when hanging at the game or when the weather is just too perfect to hang out inside. A plush king sized bed promises you sweet dreams after a long day out and about. Whether you’ve spent the day getting to your destination or have made memories with the family at your destination, you will fall in love with this space. RVing is all about feeling like you’re at home, regardless of where you are. Whether you’re in the mountains or at the beach you will feel at ease and ready to relax and unwind in the Big Country. This RV boasts a plush king sized bed in the master bedroom. Put your feet up, enjoy a glass of wine, and remember that home is where the road takes you. The gorgeous living room is located right next to the huge kitchen. You can create delicious meals then kick back and unwind. A comfortable living area that was designed to make kicking back after a day of fun an absolute joy sits at the rear of this RV. It is located near the kitchen, so you can enjoy a great meal then put your feet up at watch a movie on your huge entertainment system. If you’re interested in learning more about our selection of RVs for sale or want to look at the gorgeous Heartland Big Country 3310QSCK for sale, contact us. We can help you find the right RV for your needs for a great deal. One of the best parts of owning and traveling in an RV is being able to take advantage of all the great modern comforts that come with it, especially the appliances. These appliances can make each trip more relaxing and convenient, and one of the most heavily used appliances by far is your refrigerator. Like your fridge at home, your RV fridge will mostly be self-sufficient, but like all machines, it does need some maintenance to keep it running functionally. Modern Trailer Sales has provided some tips for you to cover the basics, but if you need additional help, stop by our location near Indianapolis and Muncie, Indiana, proudly serving Cincinnati, Ohio. Let’s start with what to do before you take off for your next RV trip. If you’re coming off a period of storage, whether it’s over the winter or just a few weeks, your camper may have been shut down while it wasn’t being used, so you’ll need to fire everything up again. This includes getting the fridge to the right temperature. To make this faster, turn your fridge on for eight to ten hours before loading it with food. You should also take this time to inspect the fridge and look for signs of damage or malfunctioning parts so you can get that taken care of before filling it. When you return from your trip, you might need to shut down the RV, either temporarily or for the winter. When this happens, you’ll want to be prepared for your fridge to defrost. Start by removing all the items in the fridge and transferring them somewhere else (hopefully your home fridge). When it’s empty, leave the doors open to make the defrosting process faster. And don’t forget that when the ice in the unit melts, it’s going to go somewhere, so lay down towels to soak up all the runoff from the fridge. 99.99% of the time, your fridge will not pose any sort of threat to you and your family. It’s designed to securely stay in place on bumpy roads, so there’s not even a risk of the door swinging open and hitting someone. However, you’ll need to be aware of that .01% of the time when it could be a concern. This happens when you start to smell ammonia. Some fridges use ammonia-based products as a coolant and, as is the risk for all parts of a machine, there’s a chance it could start leaking. The first thing you’ll want to do is turn off the unit. The coolant can start to leak all over the rest of the appliance and ruin the inner workings. The danger comes from the fumes the coolant gives off, that ammonia smell. Ammonia can lead to negative health concerns like headaches, dizziness, and can irritate the lungs. If you start to smell this odor, make sure you open all the windows and doors and have your family leave the camper. Then, contact the nearest RV technician or service center to talk about next steps. This should be the primary safety concern for all RV owners, but there are some additional concerns you’ll want to be aware of if you prefer to maintain the unit yourself. 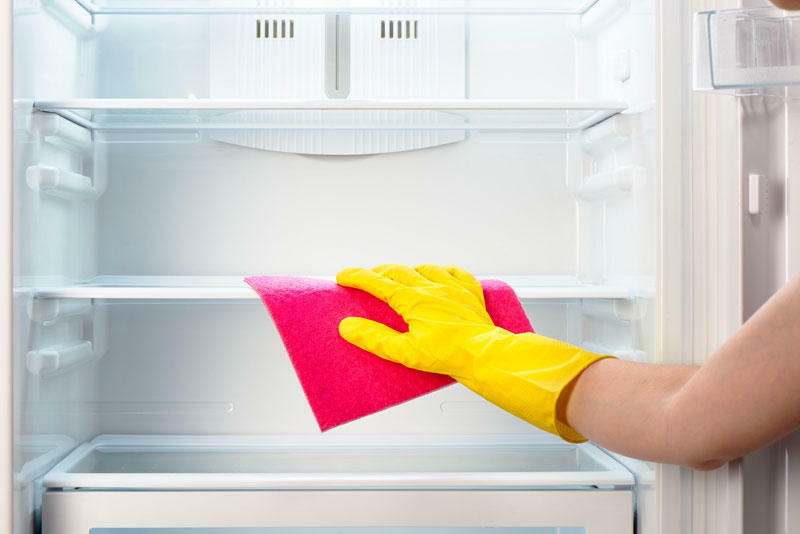 If you’re working on the fridge, make sure to clear the area of any flammable objects and always refer to your owner’s manual for helpful information on your specific model. Also, if you need to access the roof to work on the vent, follow all the best safety practices for walking on an RV roof, such as having a spotter to watch your back and wear shoes with a good grip. Summer camping is where it’s at when it comes to a great vacation that incorporates nature and plenty of freedom. Your RV takes you everywhere you want to go in the summer and provides you with a comfortable and spacious place to stay. You might find, though, that on hot days, your RV becomes pretty stifling inside, particularly if it’s an older model. That’s why Modern Trailer Sales of Anderson has prepared this list of tips for keeping your camper cool on the hottest days. Try these tricks to avoid sweltering in the heat, and come see us if you have any maintenance needs on your trailer or RV. Parking in a cool location will help immensely with the inside temperature of your RV. Whether you’re parking on a campsite or out in nature, try to find a large tree to shield one side of your camper, preferably the western side as the sun will be hottest in the afternoons. Keep the windows of your RV pointed away from the afternoon sun, too. Usually, the door side of an RV has an awning, so this is the best side to park in the sun as you can somewhat shield yourself from it using that covering. One of the best ways to stay cool is to vent out all the hot air inside your camper. You can do this by opening the windows on the shady side of your RV to let in cool air to replace the warmth. Fans will help increase air circulation, as will attic vents, which you should install if your RV doesn’t already come with them. Prop these open to let the hot air out quickly since heat rises. LED lights are much cooler when they’re on than traditional incandescent lighting, and they burn for longer, saving you money long-term. They’re just as bright as normal lights, if not brighter, while expending much less energy and heat. 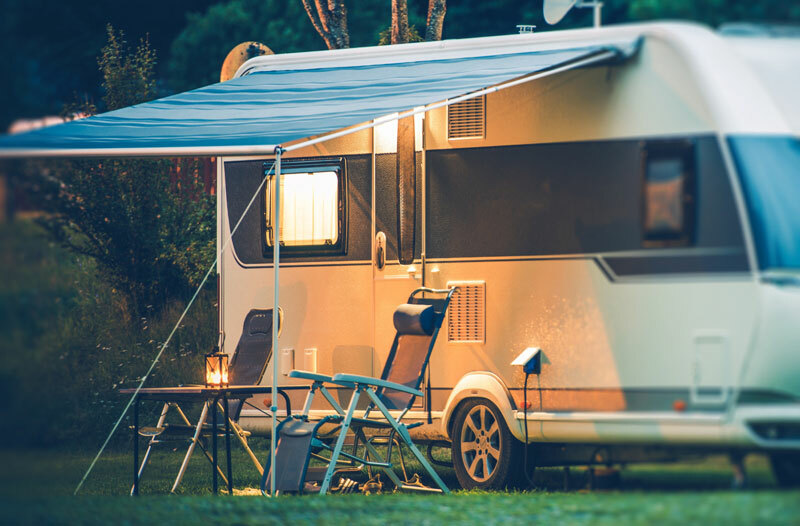 While they can be a pricey initial investment, LED lighting will help keep your camper a little cooler inside while saving energy. There are several ways to block sunlight from coming through your windows. One common method is to put up reflective bubble insulation over the windows that blocks out UV rays and reflects light away from your camper. The sun shining on bare glass can heat up your RV pretty quickly, even with the curtains shut, so adding some more protection will help cool things down inside. One way to keep the interior of your camper cool is to avoid heating it up at all costs. This means cooking outside whenever you can or simply cooking less. Fire up the grill for fish, burgers, chicken or kebabs and spare your trailer’s interior from the heat. Otherwise, you can prepare meals that rely on cold and raw ingredients, like cereal for breakfast, sandwiches for lunch and salads for dinner. Using your microwave can be a good way to steam vegetables and prepare some hot foods without generating any heat indoors, too. Looking for a new or used RV? Visit our Anderson dealership to see our huge selection of campers, trailers and RVs, including those by the latest and greatest brands. We can help you find an RV optimized to stay cool with climate control and strategic ventilation, too, so you can travel in the summer without overheating. Modern Trailer Sales serves the wider Indianapolis metropolitan area, including the cities of Carmel, Fishers, Noblesville and Muncie, Indiana.